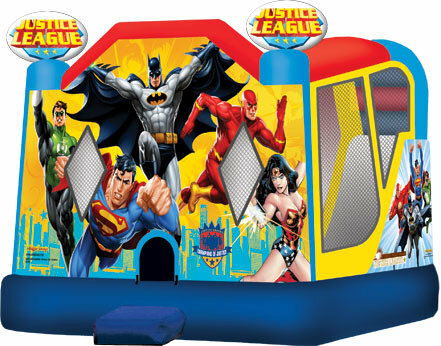 Justice League Combo 4 in 1 features Jumping, Climbing, Sliding, and a Basketball Hoop!! Not only will your guests get to jump around like a standard moonwalk they will also get to climb slide and play basketball! This unit is rented as a dry slide. If you look under Water Fun you will find it there with a water option to make this a Water Slide!! Book Today Online. *This unit does not come with basketball and must be staked down on grass.